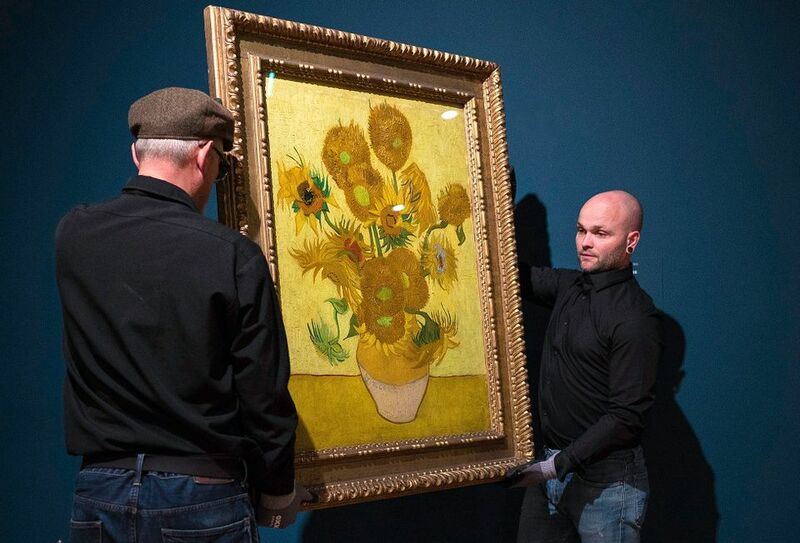 The Van Gogh Museum announced yesterday that its version of the Sunflowers will stay in Amsterdam—and never again go out on loan. Van Gogh painted seven still lifes of Sunflowers in Arles, and the Amsterdam version (1889) is a copy of the original on a yellow background, which is at the National Gallery in London. 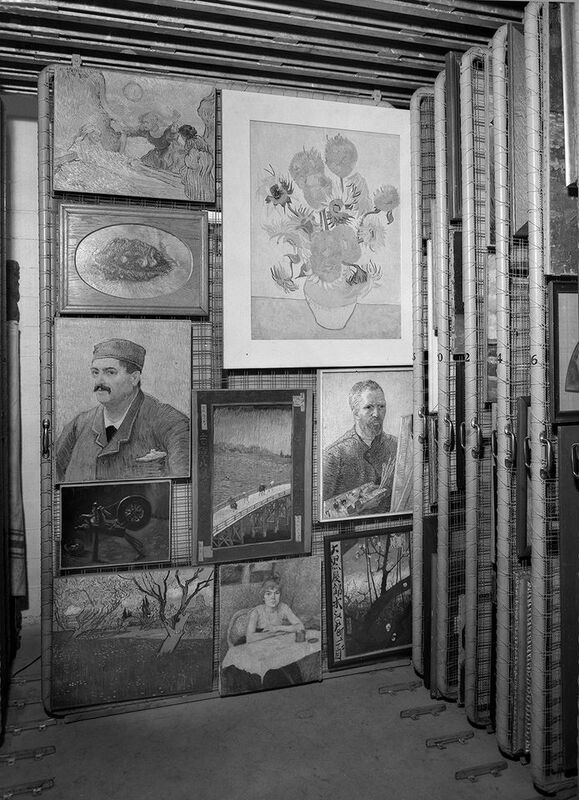 As revealed in my book The Sunflowers are Mine (to be published in paperback on 9 February), the Amsterdam Sunflowers travelled to 79 exhibition venues from the end of the Second World War up until the establishment of the Van Gogh Museum in 1973. Since then the museum has only lent it sparingly, on six occasions: to The Hague (1978), Toronto (1981), Essen (1990), Chicago (2001), Tokyo (2003) and London (2014). During the war the painting had been evacuated to a camouflaged bunker in the sand dunes on the Dutch coast at Castricum. The Amsterdam Sunflowers has been extensively studied by conservators, and most recently it was brought to the museum’s studio on 11 January, for the final phase of the work. They concluded that although the picture’s ground and paint are stable, it is “very sensitive to vibrations and changes in humidity and temperature”. To avoid any risks, Axel Rüger, the museum’s director, says that “the Sunflowers will no longer travel”. The most interesting discovery made during the research is that they were able to trace the Sunflowers to a particular roll of canvas. At least eight other paintings were made from the same roll in January 1889, shortly after Van Gogh was released from hospital after mutilating his ear just before Christmas. The Amsterdam Sunflowers was originally even brighter and more striking than it is today. Some of the original paint has changed. Red (geranium lake) has faded and yellow (chrome yellow) has darkened. These findings have led to a decision to reduce the lighting levels on the picture, from 150 lux (used up until 2014) to 50 lux (today). New LED lighting has been installed. The research has also confirmed that a 3cm wooden strip added at the top of the canvas, to extend the picture slightly, was inserted by Van Gogh—and is not a later addition. This was probably done by the artist because the flowers would otherwise have been too close to the edge of the picture, particularly when framed. The Amsterdam Sunflowers has been varnished on a succession of occasions, but the varnish is now dirty and yellowed. Some of this cannot be safely removed, because the layers of paint and varnish have mixed. In the late 1990s a wax layer was added to help secure the paint and make the surface more matt. This wax has developed a whitish quality, so it is now being removed. Several retouches from earlier restorations have discoloured, but they cannot be safely removed, so new retouches will be added on top of them. The Sunflowers is due to be returned to the gallery walls on 22 February. The painting will later form the centrepiece of an exhibition on Van Gogh and the Sunflowers (21 June-1 September). 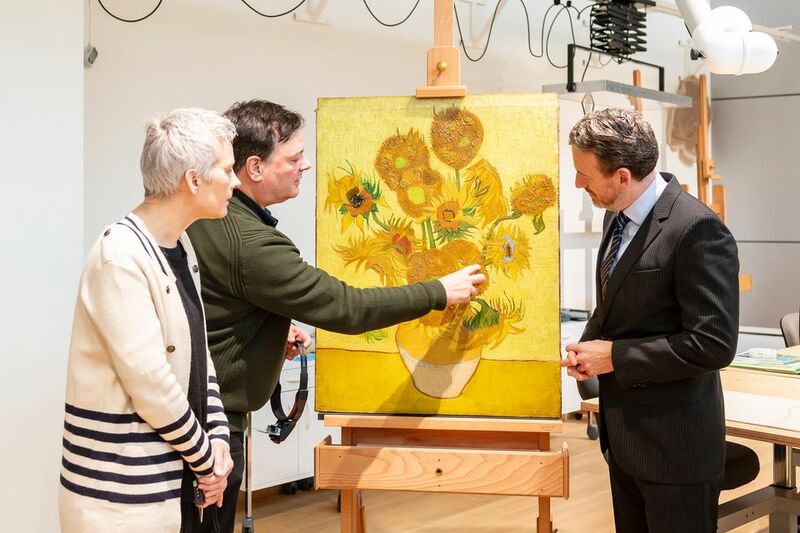 News that the Amsterdam Sunflowers will not be travelling comes only two weeks after the National Gallery announced that its version of the Sunflowers (the one which Van Gogh copied for the Amsterdam picture) is to be lent to two museums in Japan in 2020. Other works by Van Gogh from the same roll of canvas as the Amsterdam Sunflowers (with de la Faille catalogue numbers) are: another version of the Sunflowers (F455, Philadelphia Museum of Art), three versions of La Berceuse (F504, Kröller-Müller Museum; F506, Art Institute of Chicago; and F508, Museum of Fine Arts, Boston), Basket with Potatoes (F386, Kröller-Müller Museum), La Crau with Peach Trees (F514, Courtauld Gallery), Orchard in Blossom (F515, Van Gogh Museum), Still life of Oranges and Lemons (F502, National Gallery of Art, Washington, DC) and possibly the Self-portrait with bandaged Ear (F527, Courtauld Gallery).